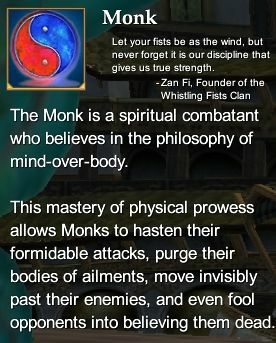 From the Everquest 2 player manual: Those who desire to engage in graceful, hand-to-hand martial combat will find the Monk profession to be an exciting path. The Monk is a spiritual combatant who practices philosophies of mind-over-body. The Monk is best served on the frontlines where her advanced physical skills are most effective against her foe. Strength (primary) - Increases your damage and maximum power. This page last modified 2011-08-25 22:55:49.